After giving lots of love to Android Wear, Microsoft is setting sights on Apple’s smartwatch with new PowerPoint and OneDrive apps. 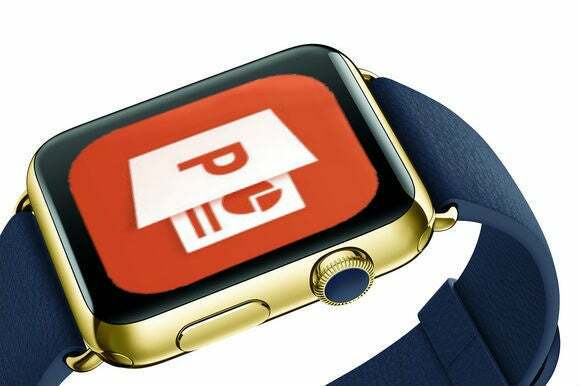 With the latest version of PowerPoint for iOS, Apple Watch users will be able to remotely control PowerPoint slideshows on the iPhone. The Watch app will show navigation controls, along with elapsed time, the current slide number, and the total number of slides. Unfortunately, Microsoft hasn’t included wrist controls for PowerPoint on other devices such as PCs and Macs, though it seems like an obvious feature to include down the road. In the meantime, users should be able to mirror the iPhone’s display on an Apple TV using AirPlay, and use the watch to control slideshows that way. Microsoft has also added Apple Watch support to OneDrive for iOS, though here the utility isn’t as clear. Users will be able to view and delete recent photos, find photos by tag, and view photo albums, but chances are you’d probably want to do these things on your phone instead. These aren’t Microsoft’s first apps for other companies’ smartwatches. Last year, the company created a OneNote app for Android Wear, letting users quickly dictate new notes by voice. On the more experimental side, an app called Bing Torque lets Android Wear users trigger a voice search by flicking their wrists, and an analog keyboard from Microsoft Research tries to tackle typing on the small screen. Why this matters: While Microsoft has its own wearable plans for Windows, along with the fitness-focused Microsoft Band, that hasn’t stopped the company from dabbling on other platforms. The Apple Watch app ecosystem is quickly turning into a land grab, as demand for the smartwatch outpaces supply. And Microsoft, with its new cross-platform push, doesn’t want to be left off anyone’s wrists.